Pre-1880 US census records can allow genealogists to gather clues about family relationships. But at their very essence they confirm that individuals are living in the same household at the point in time when the census enumeration was made. Ancestry.com’s 1870 census database now infers family relationships from the census enumeration. 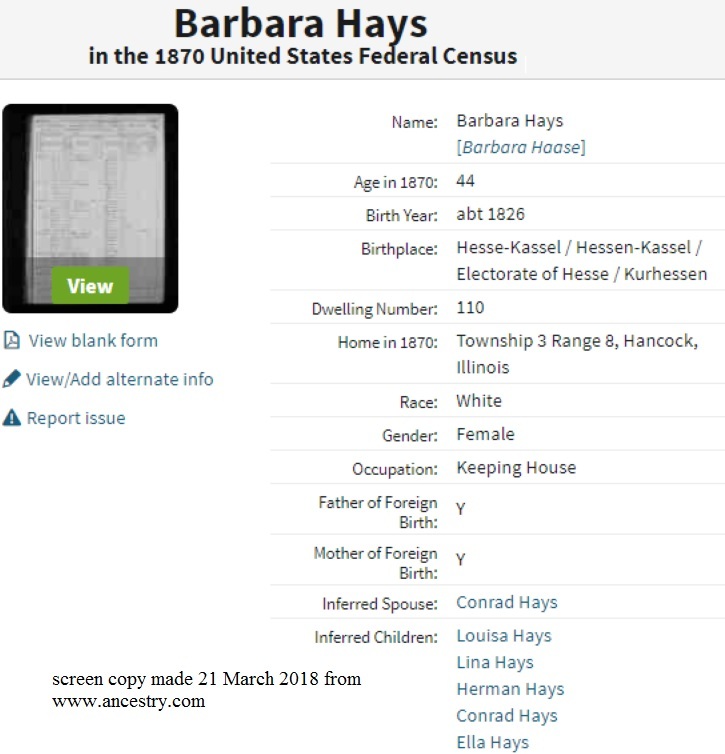 These two screen shots show that information for Barbara Hays (actually Haase) who is enumerated in Hancock County, Illinois, in 1870. The inferred spouse is correct and the inferred children are correct are correct in this case. That’s not always the situation for a variety of reasons. The problem in this specific family is that Ancestry.com infers that the children are all Conrad’s children as well–they are not. Louisa is Barbara’s daughter by a previous marriage and she was enumerated with the last name of her step-father in 1870. 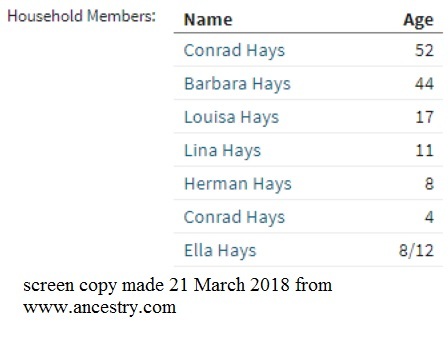 Ancestry.com also indicates that there are seven members of the Hays household. There is a thirty-two year old native of Saxony, Charley Walder, living in the household as well. At this point, his relationship to the family is not known. But he is living in the household and the “household members” list in the “record” from Ancestry.com should indicate that. 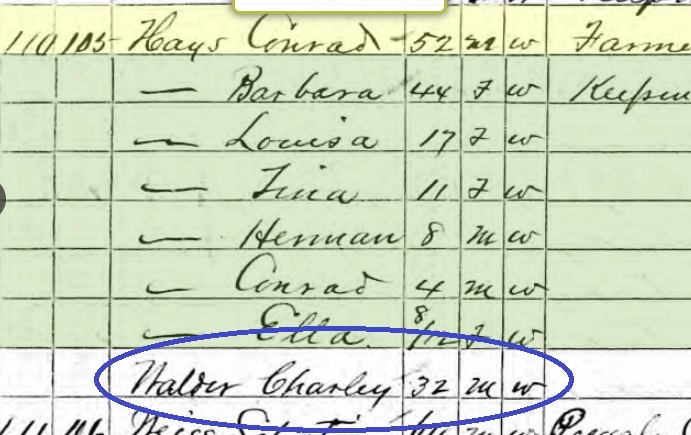 The 1870 Census database at Ancestry.com indicates that Charley is in a household by himself. It does show dwelling number 110, so that’s entered correctly. But Ancestry.com’s automated “household system” should not separate these individuals out. Those of us who always look at the original (which you should do) would easily see exactly who was in the household. But this is one of those “automate” the research process “helps” that doesn’t. Ancestry’s indexing leaves much to be desired. Your post is a reminder to never assume relationships from the index alone. The way Ancestry.com defines “inferred” does not appear to be exactly clear. So please tell me if I am wrong. If the person is inferred it is because their name may be wrong by spelling? The internet shows “inferred” like a women who is living in a house; however, the head of household does not see himself as married? Please help me understand this. It appears that Ancestry.com infers household members have the same last name–at least that’s what has happened in the ones I have seen. The 1870 census does not indicate marital status. If you have an entry from 1870 that Ancestry.com has inferred in an odd way, please let me know and we’ll discuss it or post about it. I’ve noticed that Ancestry.com use of the word inferred children leaves questioning about the census reviewed. The 1870 census does not indicate the marital status. Would this imply as the head of household being widowed or just not claiming to be married or is there a missing child of the head of household who was married to the inferred child? 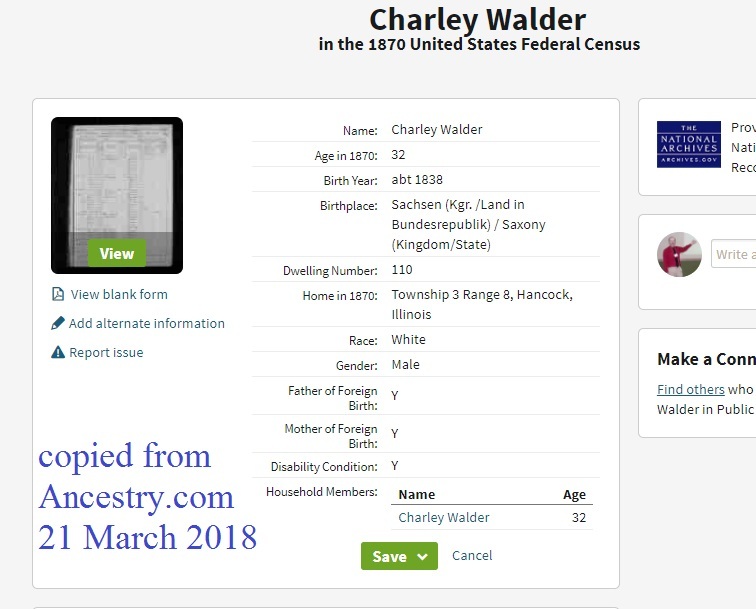 I would not put much credence in Ancestry.com’s use of “inferred” children. It’s programmed into their system and generalizes. Generally speaking if a household “appears” to be husband/wife and children, then one can use that premise to search other records. But it is always possible that it’s man/sister and his children or man/secondwife and a combination of his/hers/ours. My great grandfather was born in 1869. In 1870 he is listed in the household of the man we presumed to be his father. Father’s last name is Glodo. GGpa is listed as Albert Aiken. Im left wondering of Mr Glodo is my GGGpa. You have a typo on this page. It should say, “At their very essence…” not “there”. Oh goodness. Thank you for letting me know. I will fix that. I’m confused, does inferred children mean they are not one of the parents real children? It means that the census doesn’t specifically state they are children.